Laser is considered the most effective and common treatment for tattoo removal. Previously, removing tattoos with multiple colours meant using multiple lasers. At Advantage Laser Clinic we use the Medlite C6 Laser for Tattoo removal which are the two most powerful q-switched lasers for tattoo removal. MedLite C6 lives up to its reputation as the “workhorse” of aesthetic lasers, with unmatched Precision Beam Technology. The Medlite C6 is considered the Gold Standard for tattoo removal lasers in the industry. The Medlite provides excellent tattoo removal results which is why it is well known by industry professionals and clients. By providing a true flat-top beam profile, MedLite produces consistent results with fewer complications. The Medlite C6 is a q-switched Nd-Yag technology which means it is safer for all skin types. MedLite’s homogenous beam delivers energy evenly over the skin’s surface, minimizing epidermal injury and increasing patient satisfaction. We have extended the wavelength capabilities of our laser allowing for full-color tattoo removal—with the MultiLite Dye Handpieces for 585 nm (yellow) and 650 nm (red). Expect excellent laser tattoo removal results with the Medlite C6 with us. How Laser Tattoo Removal Works. The laser works by selective thermolysis. By targeting the ink with pulses of highly concentrated light, the laser breaks the ink into tiny fragments. These fragments of ink are then cleared away from your immune system. With multiple sessions, the tattoo will fade and in most cases, become eliminated completely. With this advanced technology scarring is minimal and most of the time non-existent, but this can vary depending on the situation. The laser tattoo removal procedure begins with the use of topical numbing which is applied to the skin for half an hour in order to minimize discomfort. Some discomfort is expected. The procedure is performed by a highly qualified technician. Depending on the size of the area and the colour of the tattoo, the treatment ranges from 10 to 30 minutes. All laser and injectable treatments at Advantage Laser Clinic are performed by nurses to ensure optimal patient safety and efficacy. Call us for a complimentary consultation to determine which laser is right for you! No obligation! No pressure! 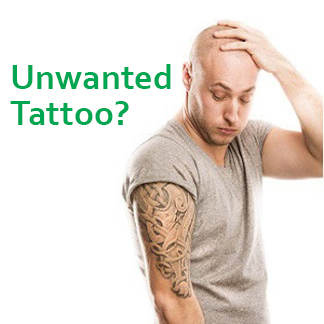 Tattoo’s greater than 8″ by 8″ or high density tattoo’s must be assessed through consultation only.